8th January Joint BiE and the3million meeting with Hilary Benn, MP and chair of the Brexit Select Committee in the House of Commons. 18th January BiE and the3million sent a letter to Donald Tusk, President of the European Council. 23rd January BiE and the3million produced Joint paper on December agreement. 31st January Meetings with Irish and German Permanent Representation in Brussels and also the Article 50 Task Force. 1st February We met with Italian Brexit steering group member, Roberto Gualtieri before attending the citizens’ rights hearing. We also attended LIBE committee and had further meetings with the office of the European Ombudsman Brexit team, and Catherine Bearder MEP in the European Parliament before Jane Golding, Co-Chair BiE spoke in the European Parliament on citizens’ rights. 8th February The advocacy team visited Westminster to meet with Hilary Benn MP and Duma Langton of the Exiting EU Committee. Later they met with the office of Shadow Brexit Minister for citizens’ rights and the Shadow Immigration Minister. 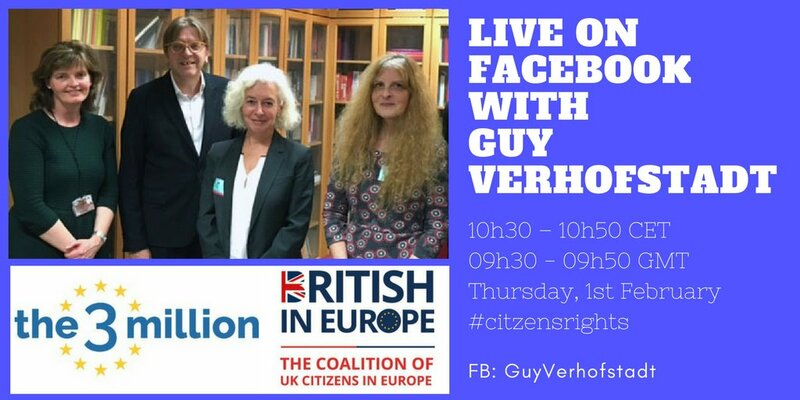 9th February More meetings in Westminster with DExEU Citizens’ Rights Team. 15th February Jane Golding, Fiona Godfrey and Christopher Chantrey attended the Assemblée Nationale, Paris. 10th April Meeting in Brussels with French Brexit lead, Ludovic Butel. 12th April BiE sent detailed suggestions and questions on the draft of the Withdrawal Agreement to DExEU and the European Commission Article 50 Task Force. 16th April We attended a hearing on Citizens’ rights in the Dutch Parliament. 18th April Meeting in Paris with the French Interior Ministry’s department dealing with registration of foreigners and residence permits. 24th April We attended a hearing of the Brexit Steering Group in Brussels. 1st May Letter sent to David Davis, Brexit Secretary, about the importance of freedom of movement. 18th May We met with German Brexit coordinator, Peter Ptassek and German MEP Helmut Scholz (GUE/NG) to discuss participation in regional events in Germany. 22nd May Co-Chair BiE Fiona Godfrey met with advisors to Xavier Bettel of Prime Minister of Luxembourg. 4th and 5th June We organised a Joint advocacy day with the3million at the European Parliament in Brussels. We met with the Article 50 Task Force and Guy Verhofstadt. We had other meetings with Barbara Spinelli (GUE/NGL), Roberto Gualtieri (S&D), Jean Lambert and Philppe Lamberts (Greens), Udo Bullmann (S&D), Claude Moraes (S&D), German Permanent Representation Brussels. Finally we met with the office of the European Ombudsman Brexit team. 6th June Members of our Steering Team gave evidence Exiting the EU Committee prior to providing oral evidence on 6 June 2018. We also submitted written evidence prior to the hearing. 12th June We gave evidence at the EU Justice Sub-Committee of the House of Lords. 23rd June British in Europe Steering Group members march for citizens’ rights at the pro-Europe demo in London. 24th June Steering Group strategy meeting in London. 9th July Joint letter with the3million sent to new Brexit Secretary Dominic Raab. 25th July Letter re ring fencing sent to Dominic Raab. 23rd August Jane Golding gives speech at British Embassy in Berlin expressing the worry and frustration of Britons in the EU and our increasing concerns about a no-deal scenario. She repeated British in Europe’s demands for an improved and ring-fenced agreement on citizens’ rights. 4th September Joint letter with the3million sent to both negotiating teams about the impact of no deal. 11th September Meeting with Hilary Benn, MP and chair of the Brexit Select Committee in the House of Commons, with the3million. 24th September Fiona Godfrey attended Council of Europe event Kyiv. 25th September Jane Golding spoke at a Fringe event on Citizens’ Rights at the Labour Party Conference. 28th September Fiona Godfrey met with Gregor Schusterschitz, Austrian Brexit coordinator. 8th October BiE and the3million met with the German Foreign Ministry Brexit lead plus German Interior Ministry and Employment/Social Security Ministry officials in Berlin. 9th and 10th October With the3million, the BiE team held a ‘Mini Lobby’ in Brussels over two packed days. We met with MEPs from the Green and the S&D groups Claude Moraes, Gillian More a TCN status expert and the Italian and Irish Permanent Representation. We met the Article 50 Task Force again and various officials including the Chef de Cabinet of Guy Verhofstadt’s office. In addition we held a drop-in session for MEPs on Citizen’s Rights and held the ‘In Limbo Event’. 12th October Fiona Godfrey met with Jean-Louis Thill and Michele Eisenbarth, Luxembourg Ministry of Foreign Affairs. Meanwhile Jane Golding met with Permanent Secretary at the Home Office Sir Philip Rutnam. 16th October Fiona Godfrey and Christopher Chantrey of the BiE Steering Group met with Olivier Cadic, Senator at French the Senate. 17th October Jane Golding and Fiona Godfrey, Deputy Chair, BiE Jeremy Morgan and representatives of the3million met with Robin Walker, Parliamentary Under Secretary DExEU plus DExEU, FCO and Home Office officials. Followed by further meetings with Paul Blomfeld, Shadow Brexit minister for citizens’ rights and Paula Kelly. 20th October The BiE Co-Chairs and members of the BiE Steering Group attended the People’s Vote march in Westminster. 22nd October Jeremy Morgan meets with members of The 5 Star Movement, together with the the3million to address the rights of British citizens in Italy and Italian citizens in the UK after Brexit. 5th November BiE Steering Team host the Last Mile Lobby of Westminster and Parliament with the3million. 6th November Co-Chair BiE, Jane Golding spoke at the ‘Deutsche Gesellschaft für Außenpolitik’ a Talk on Brexit, citizens’ rights and the People’s Vote in Berlin. 7th November Co-Chair BiE, Jane Golding attended a meeting with BMI (German Interior Ministry) and participated in a panel discusion on Moneybox live (Radio 4) regarding Brexit and UK in EU issues. 8th – 22nd November A series of meetings were held in SW France by Kathryn Dobson to inform local British nationals. 15th November British in Italy met Guglielmo Picchi, Under-secretary of State for Foreign Affairs, and consigliere to Matteo Salvini the Deputy Prime Minister of Italy. 20th November Open Meeting, British in Italy, Venice. Jeremy Morgan, Deputy Chair BiE, attended. 21st November Letter sent to Theresa May by BiE. 22nd November Jane Golding participated in a Panel discussion on Brexit and Citizens’ Rights at Europa University, Berlin. 23rd November Fiona Godfrey met the British Ambassador to Luxembourg. 27th November Fiona Godfrey attended the Article 50 revocation case at the CJEU, Luxembourg. 27th November Fiona Godfrey attended a Joint meeting with the British embassy and BRILL on citizens’ rights. 28th November Jane Golding participated in a Panel discussion on Votes for Life at Sussex University. 29th November BiE Steering Group members Kalba Meadows, Christopher Chantrey and Kathryn Dobson met Deputée Alexandre Holroyd to input into the French Projet de Loi. They went on to meet with the British Embassy, Paris and the French Ministry of the Interior. 30th November Co-Chair BiE, Jane Godfrey met with British Ambassador and Staff in Berlin. 5th December BiE and the3million attended the Committee on European Affairs, House of Representatives, the Netherlands, and participated in a roundtable discussion on Brexit. 14th December British in Italy held a public meeting in Rome. 18th December Co-Chair BiE, Jane Golding attended a British Embassy Information evening and a panel discussion with the British Ambassador in Berlin. 20th December British in Italy had a meeting with the civil servants in the ItalianForeign Affairs ministry responsible for citizens’ rights.